Currently 285 million people are visually impaired worldwide, of which 249 million has low vision and nearly 90% of them live in developing countries. A person with low vision is the one who has best-corrected visual acuity of 6/18 to perception of light and/or <10° field of vision from the point of fixation, even after the best possible treatment, he who uses or potentially able to use vision for execution of a task. Low vision intervention involves making the most of a person's residual vision to make him/her independent in carrying out the activities of daily living. The use of low vision services has been shown to contribute to a decline in depressive symptoms. Low vision care (LVC) services significantly improve reading, access to information, emotional well-being, and overall quality of life. Even though, low vision services benefits patients by improving their quality of life,, the awareness about the services among eye care practitioners (ECPs) and the uptake of low vision services continues to be relatively low even in developed countries. There is a mismatch between the need and the uptake of low vision services. Access to low vision services may be impaired by a variety of barriers, and in some countries there is limited availability of low vision services or lack of trained professionals to provide low vision services. Concrete steps have not been taken to improve the uptake of LVC services., Therefore, the aim of this study was to review the referral pathway, to identify the perceived barriers and enablers of access to the LVC services. 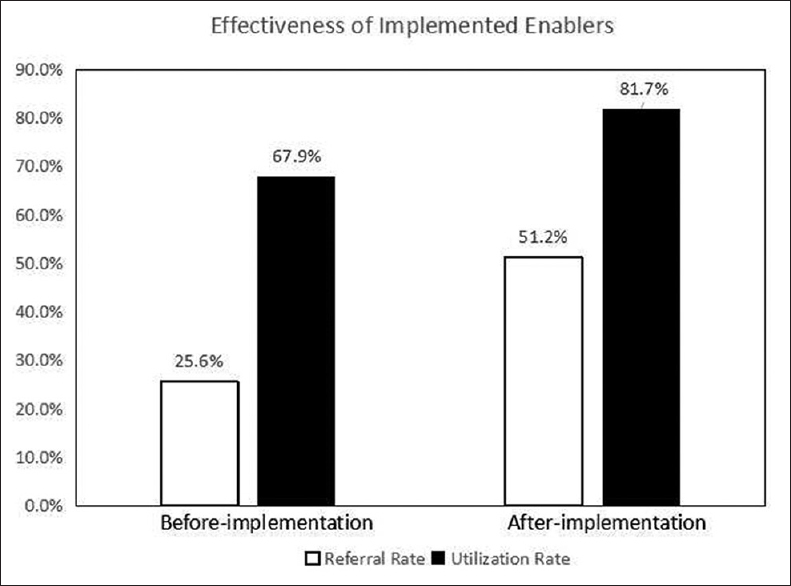 This study also evaluates the effectiveness of implemented enablers in a hospital-based setup. This was a mixed method study; qualitative study was done to identify the barriers and enablers for uptake of LVC services in a tertiary eye care hospital; quantitative study was done to analyze the effectiveness of implemented enablers. Retrospectively, 1 month data were reviewed to understand the referral and utilization of services to people with low vision. Referral rate is the number of patients referred out of the total number of patients who had low vision. Utilization rate is the number of patients with low vision benefitted by the services out of the total number of patients referred by the ECPs. For various reasons, there was a discrepancy between number of patients who had low vision and the number of referrals done by ECPs which suggested further investigation. In the qualitative part of the study, interviews were conducted among the eye care professionals and patients with low vision after getting their informed consent. Eye care practitioners with minimum of 1 year practicing experience and patients already under care of low vision services were enrolled in the qualitative part of the study. The interview guide with semi-structured open-ended questions and probes were developed based on the available literature.,,,,, The interviews were audio recorded and redundancy of information was considered as the endpoint. The in-depth interviews were transcribed into verbatim by the principal investigator. Each transcript was inductively coded to highlight the perception of ECPs and low vision patients on LVC services. Data coding and analysis were carried out using the NVivo 10 (NVivo qualitative data analysis software; QSR International Pty Ltd. Version 10.0, 2012) software. The software helped to organize and retrieve text linked by common texts. Coded data and themes evolved were categorized for further analysis. Enablers to minimize barriers were developed based on the data obtained from in-depth interviews and targeted ECPs, patients, and hospital setting related barriers. The enablers formulated were further refined using clinical expert opinions. The enablers were implemented in the outpatient department and specialties for the duration of 2 months with the approval of the hospital management. The effectiveness of implemented strategies in improving the referral rate and utilization of the services were measured in the quantitative part. The study was conducted in adherence to the tenets of the Declaration of Helsinki, and it was approved by the institutional review board and ethics committee of the Vision Research Foundation, Chennai. The mean [standard deviation (SD)] age of the patients with low vision who participated in the study was 34.9 (23.1) years; four were female and three were male. Thirteen ECPs; ophthalmologists; and optometrists were included in the study. Three themes, namely, perceived barriers, perceived benefits, and enablers to improve the uptake of LVC services emerged out of qualitative analysis. ECPs reported that lack of awareness about the referral criteria, types of low vision as well as visual rehabilitation devices, and its benefit to visually impaired, among eye care providers, and lack of knowledge, awareness and understanding about the LVC services, equipments, its impact, cost of the devices, non-availability of the services to the seeker, and among the patients were the barriers in utilizing the LVC services. ECPs also expressed that the non-availability of appointment with LVC services and longer waiting time were also the reasons for poor uptake of LVC service. ECPs shared that patient's best-corrected distance visual acuity of 6/18 or less, near visual acuity less than N10, visual field of <20°, altitudinal defect, hemianopia, ocular conditions like retinitis pigmentosa, glaucoma, retinal detachment, Stargardt's disease, post-retinal surgery, and penetrating keratoplasty were the reasons for LVC referrals. The other reasons were visual requirements of the patients and the subjective complaints while carrying out their daily living activities. ECPs also shared that the patients who reside in rural areas, illiterates, female from poor socio-economic status, physically disabled, elderly, children < 5 years of age, patients with poor spectacle compliance, and who were not psychologically prepared were the non-ideal candidates for referral. Few ECPs pointed out that social stigma, fear of the test, psychological factors like denial, depression, and the hope of getting cured by other means (medically/surgically) also hinders the patients from availing the LVC service. Poor understanding about the services, managing with residual vision, compromising the visual demand, reluctance, seeking alternatives, and non-referral to the LVC service were the common barriers stated by the patients. ECPs believed that LVC makes the patient independent to perform their daily living activities like reading newspaper, writing, signing check, and mobility. Few ECPs expressed that low vision intervention helps in continuing their occupation, education, and the environmental modification in lifestyle helps them to live a safe and independent life. Multidisciplinary approaches including rehabilitation service were highlighted by the ECPs. Patients who availed LVC service expressed better understanding about their eye condition and students with low vision reported that they were able to perform academically better with the low vision devices prescribed. ECPs suggested the need for referral criteria to LVC service along with the facilities available and the same was suggested to be circulated through E-mail, as printed circular, and web portal pop-out within the tertiary eye care hospital. Few ECPs recommended optometrist initiative on identifying and referring the patient to LVC service. Most ECPs stated that educating and training the optometrist for LVC was required. The medical records of all the patients (3322), who visited the tertiary eye care hospital for the first time in the month of November 2012, were reviewed. About 289 (8.7%) had visual impairment (visual acuity ≤6/18), out of which 70 patients (24.2%) with treatable visual impairments were excluded. About 219 (75.8%) met the World Health Organization (WHO) criteria of low vision, of which 56 patients (25.6%) were referred for LVC services. Thirty-eight out of 56 patients (67%) referred utilized the LVC services available at the tertiary eye care hospital. The enablers were developed based on the inputs derived from the qualitative part of this study. Referral criteria [Figure 1] and referral pathway [Figure 2] to LVC service were distributed to all the ECP's in the hospital as printed circular and displayed in their OPD rooms. In addition to that, it was circulated through E-mail and pop-out was given on the intranet web portal. Awareness on available LVC services was created through pamphlets and posters in each floor of the hospital. Videos of previously benefited patients with low vision were displayed on the television monitors. The stratification of LVC services helped in initiating primary level of care in every sub-specialty department like cornea, glaucoma, neuro-ophthalmolgy, uvea, and vitreoretinal services in the hospital. All the optometrists were trained in each department to attend the patients who needed primary level of care. LVC counseling chamber was established in one of the sub-specialty departments of the hospital; vitreoretinal department from where maximum referral was noted. Patients with low vision were educated on the available LVC services and the need for availing the services to improve their residual vision and/or get benefited through rehabilitation training based on their demand. Out of 4041 new subjects visited in the month of March 2014, 306 patients (7.6%) were visually impaired (visual acuity ≤ 6/18); of which, 103 (33.7%) subjects with treatable ocular conditions were excluded. About 203 patients (66.3%), (145 male and 58 female) were diagnosed to have low vision without any further intervention were included in the study. The age ranged from 3 to 89 years. 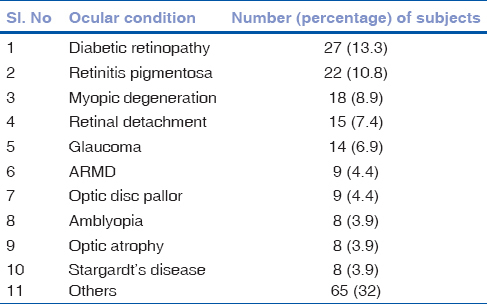 Most commonly referred ocular conditions were diabetic retinopathy (13.3%), retinitis pigmentosa (10.8%), Stargardt's disease (9.4%), myopic degeneration (8.9%), retinal detachment (7.4%), glaucoma (6.9%), and age-related macular degeneration (4.4%) as given in [Table 1]. About 104 patients (51.2%) were referred to LVC service after the implementation of the strategies, out of which 19 (9.4%) patients were lost to follow-up for further intervention. Eighty-five (81.7%) patients were provided LVC services, out of which 61 (71.8%) patients utilized the comprehensive LVC services on the same visit and 24 (28.2%) were given primary level of awareness on available services who could not utilize the LVC services on the same visit due to lack of time. The proportion of LVC referral was found to be different (χ2, P= 0.015) between low vision group before and after implementation of strategies. The effectiveness of the implemented enablers is shown in [Figure 3]. The mismatch between the need for and uptake of low vision services has been attributed to various barriers including referral pathways and different service delivery models. Therefore, this study attempted to analyze the barriers among stakeholders. To the best of our knowledge, evaluating the perceived barriers to access the low vision services, developing enablers to address the barriers, analyzing the effectiveness of the implemented enablers in a tertiary eye care hospital have not been reported earlier. It implies to highlight the importance of creating awareness on available LVC services among ECPs and patients to improve the uptake of LVC services significantly. Lack of awareness on the referral criteria to LVC service among ECPs was the major barrier for referral of patients of low vision, which affected the uptake of LVC services primarily. Hence we created the referral criteria to be distributed among ECPs to increase the referral rate. Though referral rates have been studied earlier, referral criterion was not documented as specific barrier which is a unique finding of this study. The ECPs were more focused on the treatment protocol for reducing the progression of the ocular conditions and most of the times it was directed toward stabilizing the residual vision. So, referral was not made for subjects during the treatment period. The stated referral criteria and barriers may vary from ECP to ECP based on the clinical experience, working specialty, and the level of interest. This suggested the need for low vision referral pathway which highlights the stratification levels of LVC. LVC referral improved from 25.6% to 51.2% after the implementation of referral criteria and referral pathway, highlighting the importance of adhering to the referral criteria by the eye care professionals. ECPs' perception and patients' perception were considered to be an important obstacle in accessing the LVC services by Matti et al., which is coherent with the current study where ECP's perceived factors like gender, literacy, and low socio-economic status of the patients had influence on the referral. Lack of awareness on available services of LVC was also found to be a barrier among ECPs which correlates with Jose et al. Barriers among patients were lack of awareness about the services, compromising the visual demand, and non-referral to LVC services, which was similar to previous studies.,,, Non-availability of the low vision devices was found to be a barrier in previous studies,, but in our study it was not found to be a barrier. Unlike previous studies, this study does not represent language or medical comorbidities as a barrier., Cost and compliance to LVD was reported as one of the barriers in our study contrasting from Overbury and Wittich To overcome the barriers between ECP's and patients, awareness was created on availability of LVC services through circulars, posters, pamphlets, and pop-out message in the web portal. All of the referred patients with low vision may not be able to reach the LVC clinic on the same day due to various reasons like dilatation, non-availability of appointment, and so on. ECPs stated that social stigma, fear of testing, psychological factors like denial and depression were also barriers among patients. To handle the psychological status of the patients, recommendation such as need for counseling chamber was suggested. Hence, the primary level of care was achieved in the counseling chamber established for this purpose, where the counseling included explanation of the ocular condition, possible visual prognosis, available services including low vision devices, registration in differently abled forum for receiving benefits, and option of visual rehabilitation services. LVC counseling for patient with vision loss helped the patients in understanding the benefits and to motivate them to access LVC service. Role of low vision services in improving the quality of life of individuals were communicated through posters, pamphlets, and videos to motivate new patients visiting the clinic. According to the perception of ECPs and patients, there was improvement in the quality of life of low vision patients after accessing the LVC services. Patients articulated better understanding about their eye condition after visiting the LVC clinic. The utilization of the service improved from 67.9% to 81.7% after implementation of the recommended strategies. Limitation of this study includes that the data comes from a single eye care hospital and number of patients reported in the interview was less. The key strategies can be applied in multi-centric eye care centers and cost versus benefit analysis considering patients quality-adjusted life years can be studied for even more effective service planning. Our study found that identifying referral criteria and creating referral pathway for ECPs improved the referral rate. Barriers such as inadequate understanding about benefit of services were reduced by implementing the LVC counseling chamber. Creating awareness on available LVC services and providing appointments according to the patient convenience helped in increasing the uptake of the LVC services. Pascolini D, Mariotti SP. Global estimates of visual impairment: 2010. Br J Ophthalmol 2012;96:614-8. World Health Organization. Management of Low Vision in Children: Report of a WHO Consultation (WHO Publication 93.27). Geneva: WHO; 1992. Khan SA, Shamanna BR, Nuthethi R. Perceived barriers to the provision of low vision services among ophthalmologists in India. Indian J Ophthalmol 2005;53:69-75. Wahl HW, Schulze HE, editors. On the Special Needs of Blind and Low Vision Seniors: Research and Practice Concepts. IOS Press; 2001. Crossland MD, Gould ES, Helman CG, Feely MP, Rubin GS. Expectations and perceived benefits of a hospital-based low vision clinic: Results of an exploratory, qualitative research study. Vis Impair Res 2007;9:59-66. Jose J, Thomas J, Bhakat P, Krithica S. Awareness, knowledge, and barriers to low vision services among eye care practitioners. Oman J Ophthal 2016;9:37-43. Matti AI, Pesudovs K, Daly A, Brown M, Chen CS. Access to low-vision rehabilitation services: Barriers and enablers. Clin Exp Optom 2011;94:181-6. Overbury O, Wittich W. Barriers to low vision rehabilitation: The montreal barriers study. Invest Ophthalmol Vis Sci 2011;52:8933-8. Lovie-Kitchin JE. Low vision services in Australia. J Vis Impair Blind 1990;84:298-304. World Health Organization. Asia Pacific Regional Low Vision Workshop, Hong Kong 28-30 May 2001: WHO/PBL/02.87. Geneva: World Health Organization; 2002. Keeffe JE, Lovie-Kitchin JE, Taylor HR. 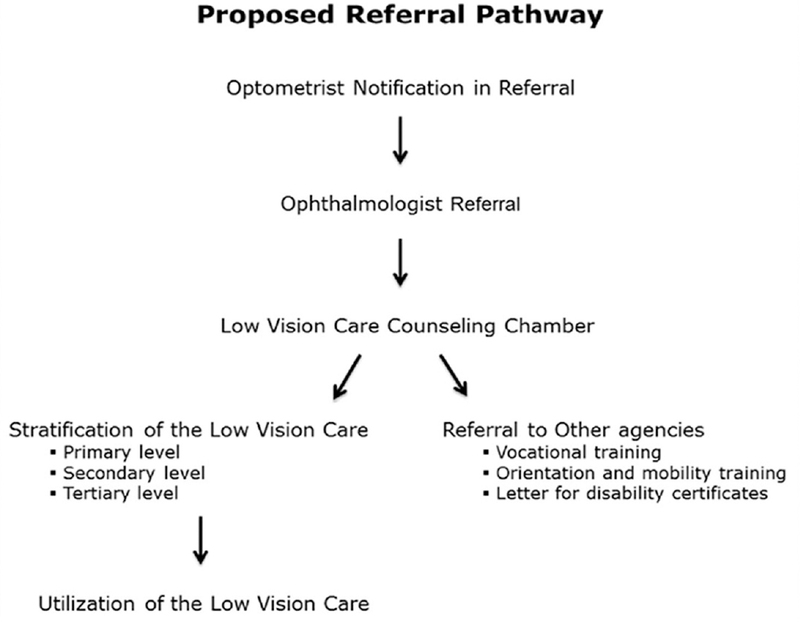 Referral to low vision services by ophthalmologists. Clin Exp Ophthalmol 1996;24:207-14. Gold D, Zuvela B, Hodge WG. Perspectives on low vision service in Canada: A pilot study. Can J Ophthalmol 2006;41:348-54. Langelaan M, Jansonius NM. 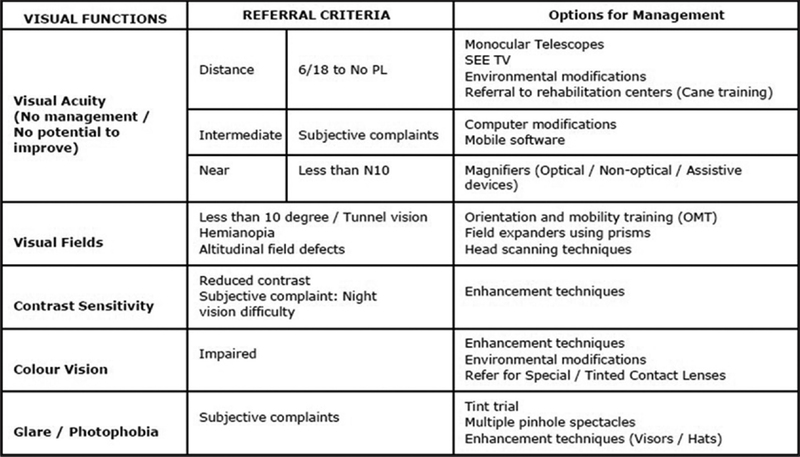 Referral for rehabilitation in case of permanent visual handicap; guideline of the Dutch Society of Ophthalmology. Ned Tijdschr Geneeskd 2005;149:1502-4. Lamoureux EL, Pallant JF, Pesudovs K, Rees G, Hassell JB, Keeffe JE. The effectiveness of low-vision rehabilitation on participation in daily living and quality of life. Invest Ophthalmol Vis Sci 2007;48:1476-82. Chiang PP, O'Connor PM, Le Mesurier RT, Keeffe JE. A global survey of low vision service provision. Ophthalmic Epidemiol 2011;18:109-21.